On Friday, February 22, 2019, I was a guest on Leonard Lopate at Large" (WBAI). You can listen to the podcast. On Friday, February 22, 2019, I flew in from Hungary to give a reading at Book Culture in New York City. We had a lively discussion. Thanks to everyone who came! In a Library Journal review (Xpress Reviews, January 4, 2019), E. James Lieberman calls Mind over Memes "an alluring choice for readers with an academic bent." My most recent essay, "Choosing a College: The Virtues of a Good Misfit," was published in Inside Higher Ed on December 3, 2018. One of my recent essays, "Reclaiming Liberty," was published in the New England Journal of Higher Education on November 26, 2018. Mind over Memes was mentioned by NUVO magazine in the November 18 edition of its weekly series Conversation Piece. Dana Mackenzie, co-author of The Book of Why, wrote the first Amazon review of the book. Publishers Weekly reviewed Mind over Memes, concluding that it is "of interest to anyone who wishes to deconstruct the truisms that infect so much public discourse." Ephrat Livni reviewed Mind over Memes—particularly the chapter on creativity—for Quartz. You can read the review here. In Szolnok, Hungary, you can now purchase the book at the Szkítia–Avantgard könyvesbolt és antikvárium. You can now read two interviews about Mind over Memes: one by the Dallas Institute of Humanities and Culture and the other by Book Culture. On Tuesday, October 30, 2018, the Dallas Institute of Humanities and Culture hosted the first event for Mind over Memes; I read from the book, engaged in dialogue with Dr. Larry Allums, and answered questions from the audience. Thanks to everyone who came and to everyone who made this event possible! You can read a Q&A here; a video will be available soon. 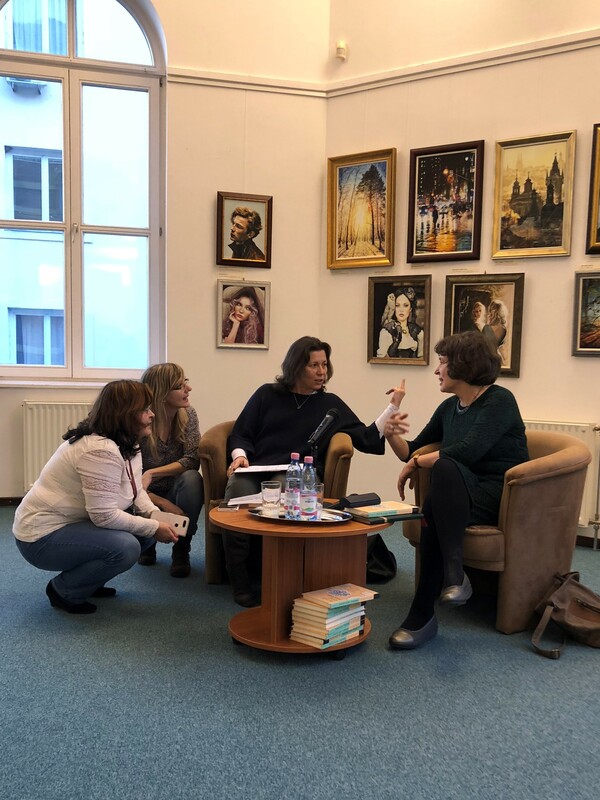 On Sunday, November 18, 2018, Massolit Books & Cafe in Budapest hosted my first Hungarian book event! 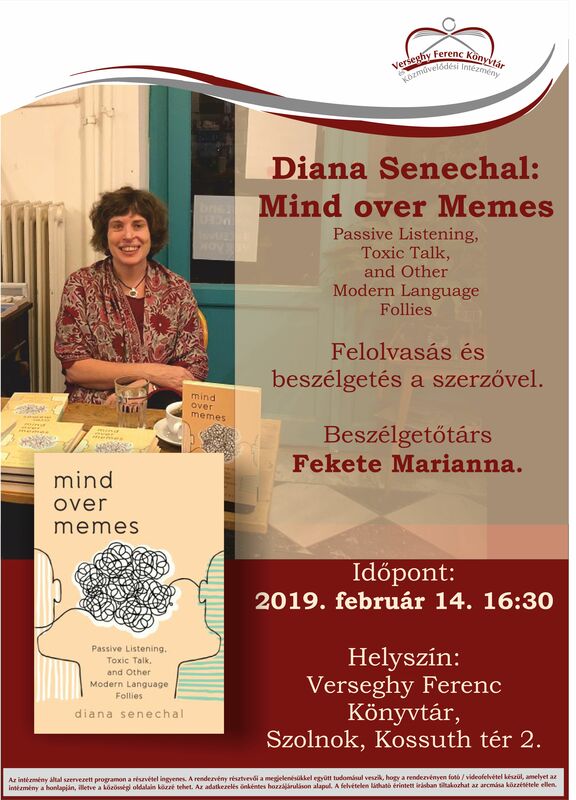 I read passages from Mind over Memes, and then we had a lively discussion about language and languages. On December 2, 2017, I began serving in a cantorial role at Szim Salom in Budapest. This is a great honor and responsibility; I look forward to fulfilling and growing within it over time. I now live in Szolnok, Hungary. As of November 6, 2017, I will be teaching at the Varga Katalin Gimnázium!. My essay "This Is a Resolution? A Letter on Bellow's Seize the Day" has been published in Literary Imagination, vol. 19, no. 3 (November 2017) and can now be viewed online. Read three of my poems from October 2017: Tuesday Evening in Fort Tryon Park," "The Rays of Royal Hope" (A Sonnet in Three Acts), and Goodbye to a Guitar" (Villanelle). In September 2017, I had the joy of attending three Budapest Festival Orchestra concerts: a church concert in Szeged and two synagogue concerts in Albertirsa and Baja. I look forward to many more. My review of the Budapest Festival Orchestra's performance of Don Giovanni is posted in Hungarian translation on the BFO website! In May 2017, I spent two rich weeks in a residency at the Sainte Pulchérie Fransız Lisesi in Istanbul. I taught philosophy classes with Dr. Nimet Küçük, whose students have participated in the CONTRARIWISE international contests for three consecutive years. In addition, thanks to Dr. Küçük's planning, I attended two plays and a concert and visited many places in the city. On my own, I walked around and listened to musicians on Istiklal Avenue. Here is an article about my visit. The video of my TEDx Talk (TEDx Upper West Side, April 26, 2016) is now up on YouTube. I criticize our cultural emphasis on takeaways, "the pocketable answer, the successful transaction, the surety squeezed from things unsure." With examples ranging from algebra to Hamlet to theatre reviews, I argue for uncertainty and questioning. On September 25–26, 2015, I spoke at the 2015 Education Forum of the Dallas Institute of Humanities and Culture, along with Louise Cowan, Andrew Delbanco, Diane Ravitch, Bill Deresiewicz, Elizabeth Samet, Matthew Crawford, Dan Russ, and Ben Olguín. Here is a video. Read Stella Schindler's wonderful review of Republic of Noise (Humanum 2015:2). CONTRARIWISE, my students' philosophy journal, is featured in my article "You Are Embarked: How a Philosophy Curriculum Took Shape and Took Off" (American Educator, Spring 2015). See Anna Citrino's commentary—with quotes from Republic of Noise— on the importance of solitude and the relation of solitude to song. On May 18, 2014, my students celebrated the release of their philosophy journal, CONTRARIWISE, at Word Up Community Bookshop in Washington Heights. The event featured readings, empirical Shakespearean experiments, philosophical improv, philosophical questions, surprise awards (including a Gogol Award, an H. G. Wells Award, and a Godot Award), a song, a cake, and more. See the descriptions on Chalkbeat and on Joanne Jacobs's blog. At TVS School in Mysore, India, students learn about the strengths of solitude. Marise McConaghy, deputy principal of Brisbane Girls Grammar School in Australia, drew on my blog post "The Need for Eccentricity in Education" in an inspiring commentary on the school. Stella Schindler, "Attentive to What Lies Within," Humanum 2015:2. William K. Lawrence, book review, Goodreads, July 8, 2013. Rosanna Warren, book review, Literary Matters (ALSCW), Spring 2013. Karen Virag, "In Praise of Solitude" (book review), ATA Magazine (Alberta Teachers' Association), vol. 93, no. 1 (Fall 2012). Ken C., "Let Us Now Praise (and Empower) Quieter Students: Part Two," RAMS English (blog), July 16, 2012. Laura Leaney, book review, Goodreads, July 12, 2012. Ryan Kinser, "Yes, I Snatched a Teacher's Trash," TransformED (Center for Teaching Quality), June 15, 2012. J. A. Helfer, book review and "Essential" rating, Choice: Current Reviews for Academic Libraries (American Library Association), June 2012 (subscription required). Dexter Palmer, "I Can't Hear Myself Think" (book review), Truthdig, May 25, 2012. A. Graham Down, "Schools vs. Noise" (book review), Education Next, March 14, 2012. Brian Rhode, lecture review of Republic of Noise, William K. Sanford Town Library, Loudonville, NY, February 22, 2012. Carol Hoenig, "In Praise of Solitude," Huffington Post, January 12, 2012. Republic of Noise was named an Outstanding Academic Title of 2012 by Choice (American Library Association). In 2011 I was awarded Hiett Prize in the Humanities, an annual prize given by the Dallas Institute of Humanities and Culture. My article "Why Do We Need a Philosophy of Education? The Forgotten Insights of Michael John Demiashkevich" was selected as the Article of the Year for Volume 37 of the American Educational History Journal. Cynthia Haven, "Why Reality Holds Little Love for Poets," The Book Haven: Cynthia Haven's Blog for the Written Word (Stanford University), September 2, 2012. Kerry Shawn Keys, "Letter from Vilnius," Poetry International, March 3, 2012. John Taylor, "Poetry Today: Tomas Venclova," Antioch Review, Summer 2010 (brief review of The Junction by Tomas Venclova, with commentary on the translations, including Senechal's). Sam Leith, "House of Flames," Poetry Review 99, no. 2, Summer 2009 (review of The Junction by Tomas Venclova, with commentary on the translations, including Senechal's). Michael Scammell, "Loyal Toward Reality," New York Review of Books, September 24, 1998 (review of Winter Dialogue by Tomas Venclova, with commentary on Senechal's translations). Sven Birkerts, "Winter Dialogue by Tomas Venclova," Harvard Review 14 (Spring 1998). Via JSTOR.